Dead Red Gum trees, Lake Pamamaroo near Menindee. 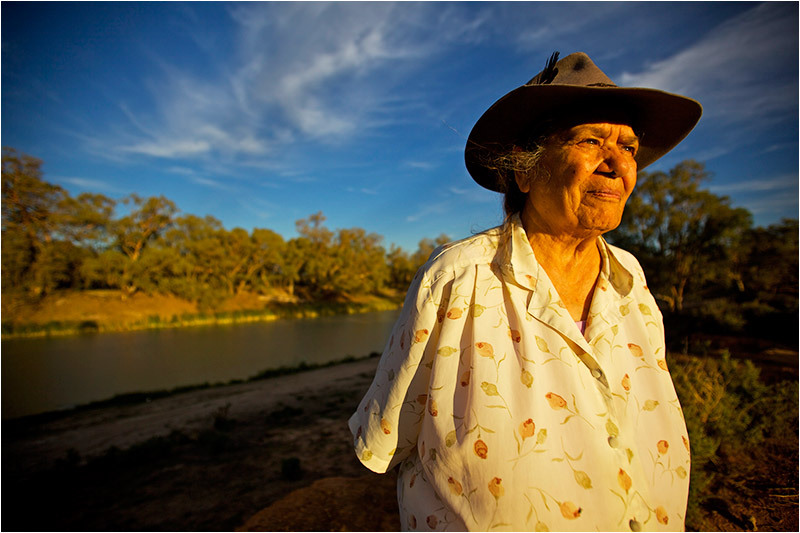 MENINDEE, New South Wales – Aunt Beryl Carmichael, a storyteller and elder of the Ngiyaampaa (nee-yump-pah) people, was born more than 70 years ago on an Aboriginal mission across the Darling River from this desert town. Back then, the water was clear and the river flowed free for 1,800 miles, from its sources in five watersheds in Queensland and New South Wales to Wentworth, where it met the Murray River. Back then, too, Menindee was still home to some of its earliest settlers, who had built a hotel in 1853, which is still in operation, and had established huge sheep and cattle ranches in the bush, one of which is now a national park. Old Pondu, the river cod, whom the Ngiyeempaa creation tale credits with dragging the earth to create the Darling, would have been well satisfied. But Carmichael, who is steeped in the 29,000-year history and culture of her people, says that Old Pondu and his helper, Mudlark, have not been pleased for a long time. The Darling today is muddy, polluted and sick. Studies by numerous university biologists and the New South Wales environment department show that its water is contaminated by pesticides from vineyards, orchards and cotton fields upstream. Continuing irrigation, even as the 12-year drought has reduced allocations to growers, has contributed to rising levels of salt in the water. Pressured by public concern, New South Wales has committed $300 million U.S. to buying water rights, conserving large tracts of land, and recharging underground aquifers to reduce evaporation and return more water to the environment. The intent is to recalibrate how the Darling River’s water is used, providing less for agriculture and more for environmental restoration. In addition, cotton and fruit producers have installed new, water-conserving irrigation practices, though cotton remains one of the thirstiest crops in the world and accounts for 15 percent of the total water used for agriculture in Australia, according to agronomists. As Beryl Carmichael and many of her friends say, the changes make sense, even if they are late. Native species of birds, fish and mammals have either disappeared, say government studies, or are in severe decline. By far the most visible evidence of the river’s deteriorated condition is apparent in the vast expanses of dead red gum trees, a hearty desert species that has been capable of living for centuries in Australia’s rugged cycles of heat and drought. But around Menindee, Red Gums didn’t perish because of dry conditions. Quite the contrary. They were drowned by a manmade system of water storage lakes that trapped the trees in lakes and suffocated their roots. The Darling River and Beryl Carmichael’s life are tied by the same currents of change, particularly the passage in 1949 of the Menindee Water Conservation Act. The statute, approved by New South Wales, authorized construction of dams and channels that would store water in a network of four lakes, just one of them manmade. Before the dams were built at a cost of $11 million, three of the lakes would periodically fill with floodwaters from the Darling and gradually drain out, sometimes taking a year or two to empty. The natural ebb and flow of the river, which both old timers and fish and game reports said supported healthy sport fisheries, teeming flocks of birds, and a productive livestock sector, ended in 1960, when the Menindee project opened. Click here to watch and hear Carmichael sing a lament for the river to come back. Video by Aaron Jaffe for Circle of Blue. By then, Carmichael’s family had been forced by the government to leave their mission home for a small cinderblock house in town. She later raised a family in that same house before starting a new career teaching in Broken Hill, a mining town of 25,000 residents about 70 miles away. Water from the Menindee lakes, more than 2 million acre-feet, fed farm development for miles upriver and down, and also provided drinking water through a pipeline to Broken Hill. Grape and stone fruit growers settled in the area. Some of the water was used to irrigate a portion of Australia’s $1.5 billion annual cotton crop. For a time in the 1980s and early 1990s, Menindee’s population soared to more than 1,000 residents. But the epic drought that has gripped the region since the late 1990s displayed the vulnerability of the desert, agriculture and human settlements dependent on stored water that was in short supply. As a girl, Carmichael stood on the banks of river, delighting in the wild emu eggs she collected for food in lakes that filled and emptied, and the abundant fish and river mussels that were eaten at festivals. She slept under red gum trees, something that can’t be done today because the big limbs regularly crack and fall to earth.